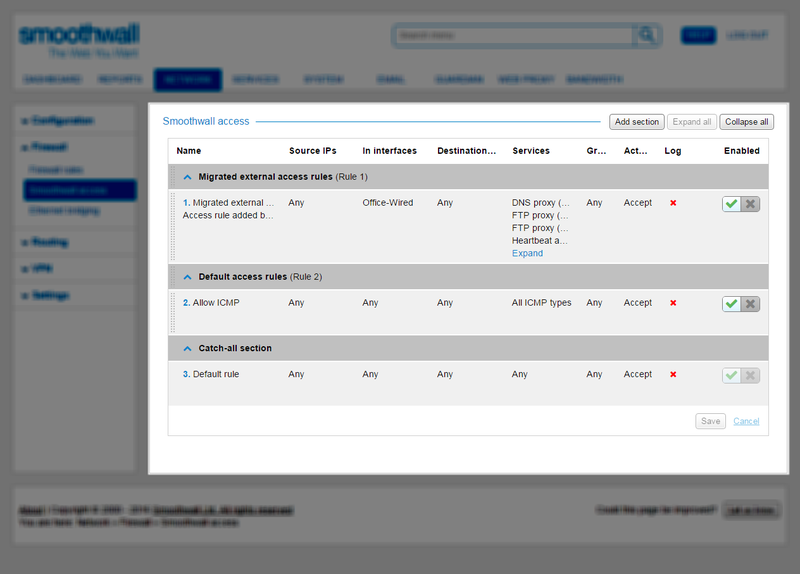 You can control access to services, for both internal and external traffic, running on the Smoothwall with Smoothwall access rules. • All ICMP types Internet Control Message Protocol (ICMP) is used by network devices to send error messages, ping requests, and so on. This service is for those messages that are specifically addressed to the Smoothwall. • DNS proxy (53) The DNS proxy service is used to provide internal and external name resolution services for local network hosts. If the Smoothwall has multiple interfaces configured, you must configure a DNS rule for the specific interface clients use to connect to, on port 53. You configure the DNS proxy in the Using Domain Name System Services page. • FTP proxy (2121) This proxy manages FTP traffic. If the Smoothwall has multiple interfaces configured, you must configure an FTP rule for the specific interface clients use to connect, on port 2121. You configure the FTP proxy in the Using the FTP Proxy Service page. • FTP proxy alternative (21) This is an alternative port number that you can use with the FTP proxy. • Heartbeat admin on HTTPS (440) This is the port number used to access the failover unit's administration user interface in a hardware failover configuration. You configure failover on the Managing Hardware Failover page — note that a Unified Threat Management serial is required to view this option and page. • Kerberos Login (814) This is the port that Kerberos users connect to (as part of their web filter authentication mechanism) when proxying through the Smoothwall web filter. You configure Kerberos authentication on the Creating Authentication Policies page — note that a Guardian license is required to view this option and page. • MobileProxy server (61001) This is the port number your MobileProxy clients connect to when proxying through the Smoothwall web filter. If the Smoothwall has multiple interfaces configured, you must configure a MobileProxy rule for the specific interface clients use to connect, on port 61001. You configure MobileProxy in the Starting MobileProxy page — note that a Guardian license is required to view this option and page. • Other web access on HTTP (80) Allows other web traffic on port 80 access to the Smoothwall. • Other web access on HTTPS (442) You access the Smoothwall user portal via this port — see About the User Portal. • RADIUS accounting (1813) RADIUS accounting messages are sent and received on this port from Bring Your Own Devices (BYOD). If the Smoothwall has multiple interfaces configured, you must configure a RADIUS rule for the specific interface clients use to connect, on port 1813. You configure RADIUS communications for BYOD devices in the Using BYOD with Smoothwall page. • RADIUS authentication (1812) RADIUS authentication messages are sent and received on this port from Bring Your Own Devices (BYOD). If the Smoothwall has multiple interfaces configured AND the Smoothwall is acting as both the authentication and accounting server, you must configure a RADIUS rule for the specific interface clients use to connect, on port 1812. You configure RADIUS communications for BYOD devices in the Using BYOD with Smoothwall page. • SIP (5060) This proxy manages Session Initiation Protocol (SIP) traffic for VoIP networks. You configure the SIP proxy in the Using the SIP Proxy Service page — note that a Unified Threat Management serial is required to view this option and page. • SMTP (25) This port handles network traffic to Anti-Spam's email relay. You must configure an SMTP rule for the specific interface clients use to connect, on port 25. You configure the SMTP relay in the Configuring the SMTP Service page — note that an Anti-Spam license is required to view this option and page. • SNMP (161) This port handles all SNMP traffic. You configure the SNMP service in the Using the SNMP Service page. • SSH-based admin (222) When accessing the Smoothwall via an SSH terminal, you must use port 222. • Web-based admin on HTTP (81) When accessing the Smoothwall administration user interface over HTTP, you must use port 81. • Web-based admin on HTTPS (441) When accessing the Smoothwall administration user interface over HTTPS, you must use port 441. • Allow ICMP — Internet Control Message Protocol (ICMP) is used by network devices to send error messages. By default, ICMP is allowed through all interfaces, but you can adjust this to suit your organizational needs. • Default rule — Handles all "other" network traffic from allowed services to this Smoothwall that does not match any other Smoothwall access rule. You cannot delete this rule, but it can be edited to suit your organizational needs. 2. Locate the parent section for the new rule. a. If you want the rule to be the first of that section, click Add rule > Top of section from the section heading. b. If the you want the rule to be the last of that section, click Add rule > Bottom of section from the section heading. Click Add > Rule above or Add > Rule below depending on the desired location. 4. Configure a meaningful Name for this rule. If logging is enabled for this rule, the name is included in log entries. From the Firewall log viewer (see Viewing Firewall Logs), you can click the rule name to return to this page. 5. If required, select the Source IP addresses relevant for this rule. To apply this rule to all IP addresses, use Inbound interfaces instead. If no IP addresses are selected for this rule, Any is shown in the Smoothwall access rules table, meaning all IP addresses are processed. If no interfaces are selected for this rule, Any is shown in the Smoothwall access rules table, meaning all interfaces are used for this rule. 8. If required, select the Services relevant for this rule. Leave blank to include all services. If you are creating an Accept rule, this setting is mandatory; at least one service must be selected. For Drop or Reject rules, you can optionally leave this setting blank to cover all services listed. If no services are selected for this rule, Any is shown under Services in the Smoothwall access rules table, meaning all services received are processed. 9. Group members are identified by their IP address. A user does not need to be logged in to be considered a member of a group; traffic from those IP addresses is assumed to be from those group members.You can create rules for traffic that ORIGINATES from groups. If required, select those Groups to match against. If no groups are selected for this rule, Any is shown under Groups in the Smoothwall access rules table. 11. You can choose to Log matching network connections to the Firewall log (see Viewing Firewall Logs). As this can generate a large amount of log data, it is recommended you enable this only for Drop or Reject firewall rules. 12. If required, configure an optional Comment for this rule. 14. If required, you can move this rule to a new location— see Reordering sections. Tip: It is possible to configure a Smoothwall access rule that prevents access to the Smoothwall administration user interface for all IP addresses and interfaces. Our knowledge base article details the steps necessary to regain access — see https://kb.smoothwall.net/Content/general/access_webui.htm. Warning: Deleting a section removes all rules in that section. It is recommended you move all rules to another section first.